Black Friday marks the beginning of Christmas Shopping and this year it falls on Friday 23rd November. Ho, Ho, Ho and a shopping bag of goodies! According to research done by Skyscanner, the cheapest time to book is the ‘post lunch slump at 2pm’. So after you come back from your lunch break, take a cheeky browse and bag the trip of a lifetime! How much can you save on plane tickets on Black Friday? Ok, that doesn’t sound like a lot… but it all adds up if you’re looking at £500 flights to Hong Kong! Last year the biggest savings were on flights from the UK to Lisbon. Where can I get flight deals on Black Friday? Skyscanner will be releasing a dedicated page to their Black Friday deals on the day, so keep your eye on their site and social media for any announcements! Keep your eyes on the prize, fingers poised on the buy now button and get ready to travel for cheap in 2019. They will also be releasing a page full of goodies for Cyber Monday. Which cities have the best bargains? We’ve had a roam around the world for the best cities for shopping and the best ones to find bargains in. All these places make great city breaks and all participate in the sales season. We recommend seeing Hamley’s, Selfridges and Harrods when you visit London’s Black Friday. Hamleys feels like going into the books of Charlie and the Chocolate Factory and is great for buying the kids’ Christmas presents. For the grown ups, the festive lights at Harrods and Selfridges are a must. To many local Londoners, the Regent Street Christmas Light switch on means it really is Christmas time. While you’re there, why not stop by Winter Wonderland or skate on a festive rink at Kew Gardens, Natural History Museum or Somerset House? How long do sales last: Black Friday isn’t as big in the UK as it is in America. Many stores will keep Black Friday sales open throughout this week but it’s worth checking online before you go. You can’t visit New York’s shopping districts without going to Macy’s! It’s the world’s largest department store so you’re bound to find presents in there for everyone. Our other recommendation is for Bloomingdales which shows the more traditional New York Christmas seen in Home Alone, Miracle on 34th Street and Elf. Macy’s is also famous for it’s Thanksgiving Parade, a must-see if you’re out in New York over the holiday season. How long do sales last: Christmas Sales will run up until the big day, but the best bargains are going to be on Black Friday itself. Our top tip for tourists at Vegas’ Black Friday event is to avoid the main strip and head for stores like Banana Republic, Saks Fifth Avenue and the Miracle Mile Stores. It’d be rude not to take in a bit of the party atmosphere and visit a club or a casino or two. Just bear in mind that Las Vegas is particularly crowded at this time of year! How long do sales last: Like everything in Las Vegas, the shining lights never go out and the party is all holiday long; Black Friday deals will almost be exclusively on Black Friday and Cyber Monday so get in early to get the best deals. Get on board with Paris’ biggest Black Friday event. The top shop to visit en Paris is the Fnac on Champs-Élysées who are giving away great offers across all four days (from Black Friday to Cyber Monday). We also recommend visiting Auchan since they have 60% off most products and Sephora to add a little chic à la mode to your Parisian break away. Famous for the Eiffel Tower, Paris is also hot on its Christmas markets; we suggest exploring the traditional side of Paris at Christmas rather than just their fashionable high street stores. How long do sales last: Across the four days spanning from Black Friday to Cyber Monday. The big brand savers in Milan (darling…) are Stradivarius, Sara, Michael Kors and Kiko Milano. While the Milano stores engaged with Black Friday tend to be brands you recognise from our own local high streets and duty free, you shop with the added Italiano luxury. While you’re exploring the shops, we recommend adding some of Milan’s rich culture with Sforzesco Castle. It is an incredible building and very central so you won’t be far from the shiny lights and ‘SALE’ signs. How long do the sales last: Not exclusive to Black Friday, but most of the deals available in Milan will be on November 23rd. Cyber Monday will still exist online. We recommend setting a budget on your Black Friday purchases. 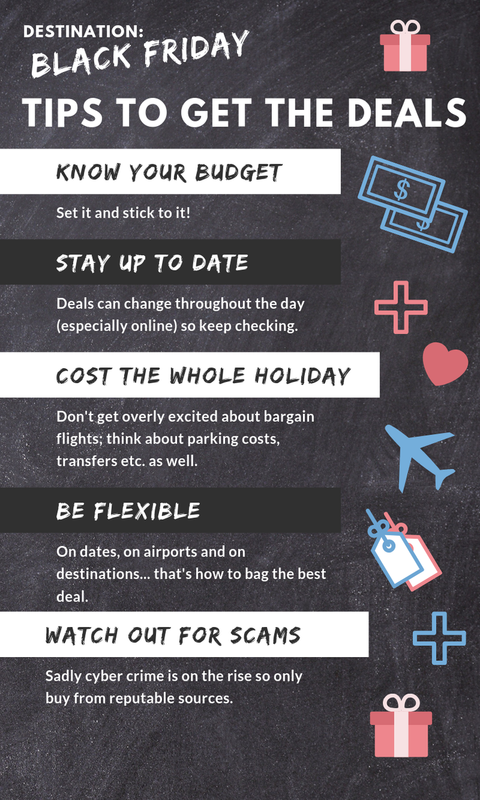 Rather than getting carried away on buying expensive flights to Sydney when you started looking at £30 flights to Paris – make a budget and only spend what you’re comfortable spending. Be flexible on dates and which UK airport you’re open to flying from. The best deal to your chosen destination might be departures at Bristol and arrivals down in Exeter, so long as you take public transport, changing airports could be a good way to save money on your travel! Bare in mind all the costs. Getting cheap flights might mean airport parking prices go up or vice versa. It’s worth considering your travel needs (transfers, parking and hotels) rather than seeing a great deal on a flight and having a shotgun purchase. Airport Parking Shop, major airlines and Skyscanner are all reputable sources but sadly there’s a fair amount of cyber crime around on Black Friday’s online deals. If it looks suspicious and too good to be true, then it probably is. We’re sure you’ll grab a great bargain (we know we’ll be keeping an eye on flight deals)!